A SayulitaLife list of Wedding Planners & Designers. Luxury-beachfront weddings, beautiful locations, and professional planners who specialize in personal, creative, and fun experiences. A full service wedding planning and event design company made up of passionate, design savvy individuals. We are here to help you organize, plan and coordinate every step along the way for your special day to fit any wedding y.. Experienced Sayulita Destination wedding planner offering inspiration, taking care of all details and ceremony preparat..
We are a full-service event planning, design and DJing company. With years of professional experience, we don't ski..
Sayulita Dream Weddings Crafts Uniquely Individual, Fabulous, FUN Events-of-a-Lifetime that will have your guests procla..
Fireworks, Flowers, Forever! 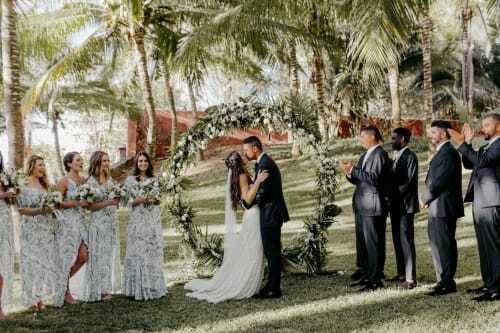 Don Pedro's is now offering complete wedding services in addition to the restaurant an..
From simple beachside ceremonies to fabulous private villa receptions, Sea of Dreams makes your picture-perfe..
Voted "Best Of" by Sayulita Life in 2014! Sunset Soiree will help you design wedding and events that you..
Vida Bonita Events is located in San Pancho. We specialize in wedding and event planning for San Pancho, Sayulita and s..